Something on the beach? – Its a Whale!! Karachiites standing over the Whale! What Karachiites saw on September 20, on the Clifton beach was the largest specie of cetacean along the coast of Pakistan. A twenty-one metre long (74 foot), was the body of the whale. The body of the whale was decaying which may suggest that the animal might be bigger than what it is being believed. The whale might have died some 3 to 4 weeks ago because the skin was decomposed and the muscles had started breaking. There were some identification marks such as its flippers and size, which all suggest that it could be a blue whale. The cause of death is also not known as there could also be a natural cause of death. What was on the Karachi coast? It was a whale but the exact species of this animal is still however unconfirmed as it could be a baleen whale or blue whale, belonging to the suborder of baleen whales. Baleen whales also called the whalebone whales or great whales are described by having baleen plates for filtering food from water, rather than having teeth. This distinguishes them from the other suborder of cetaceans, other marine mammals. Despite their enormous size, baleen whales are able to leap completely out of the water. They can grow to 190,000 kilograms in weight and 33.5 metres (110 ft) in length. These types of whales live in small groups called Pods. The behavior of Baleen Whale matches that of the Humpback Whale, they tend to be much larger than toothed whales. Since the blue whale is the suborder of the baleen whale, the blue whale is the largest living animal in the world. They can also grow to 33.5 metres (110 ft) in length. A blue whale’s tongue weighs around 2.7 metric tons, Its heart weighs 600 kilograms and is the largest known in any animal. They migrate to tropical-to-temperate waters during winter months to mate and give birth to calves. They can feed throughout their range, in polar, temperate, or even tropical waters. The one in Pakistan was 74 foot long in length! Is this the only whale? All types of Whales reproduce at a very slow rate and thus a small numbers of whales are born each year. More whales are being killed than being saved. This has resulted in extinction of many whale species and the endangerment of many others. 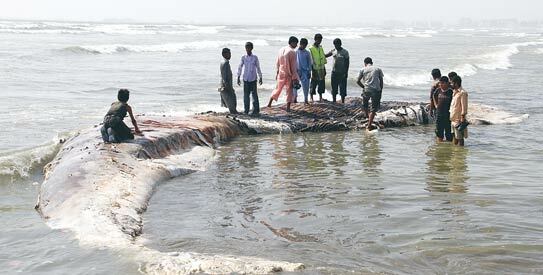 So go to the beach quickly as this could be the last time you will ever see a whale in Pakistan! ← The Himalayan Earthquake: Death toll rises! The last line is such a sad one! yes, we should try to save all animals of this world.